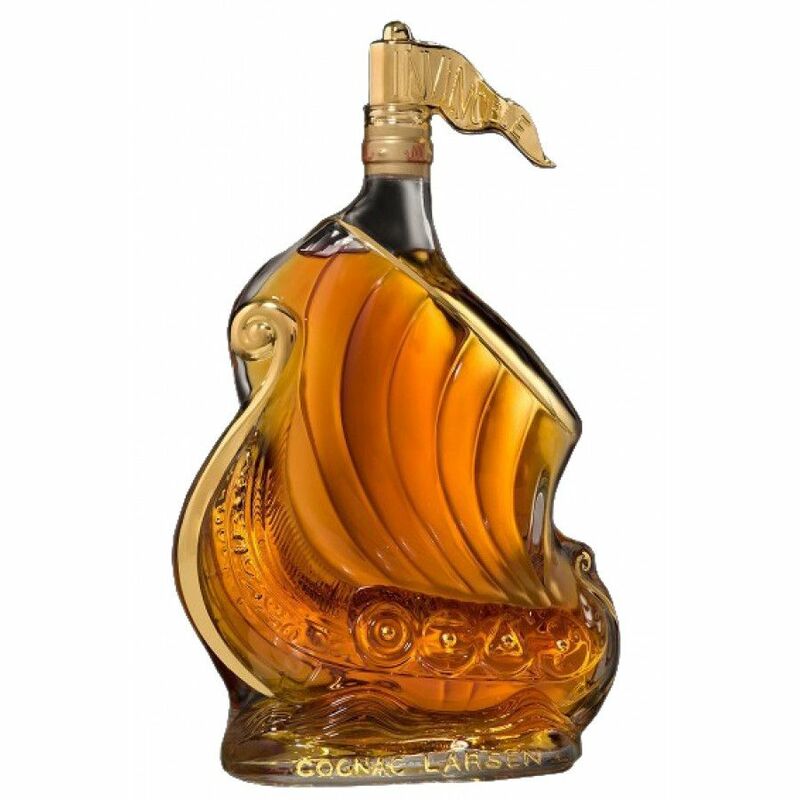 The Larsen Viking Ship Gold Cognac is one of a collection of Fine cognacs housed within a historically un-changed (since 1952), glass Limoges Porcelain decanter. Each is hand painted and finished in 24 carat gold by artisan craftsmen, and this run of gold ship decanters is as beautiful as all the others in the collection. The cognac itself (if you dare open it to taste...) is a blend of bothe Grande Champagne and Petite Champagne. This is truly a work of art that will appeal to both cognac lovers, and those who collecto beautiful works of art. Known as ‘The Cognac of Vikings,’ Larsen Cognac has striven to produce and offer products of high quality at selected points of sale throughout the world. A family run concern, the story of Larsen Cognac dates back to 1926 when Jens Reidar Larsen made the move from his home country of Norway to France. Seduced by the quality of the brandy that came from Cognac, he devoted much time and effort to become a connoisseur in the subject, and naturally progressed to owning and running his own cognac house. Today, Larsen Cognacs are as well known for their luxury packaging as the quality of their eaux-de-vie, with Limoges Porcelain and Baccarat Crystal featuring strongly with many of their premium cognacs. Tasting notes by Larsen: Fresh and fruity, wonderfully balanced by the power of accents of vanilla, candied fruit, mature fruits, marmalade, and citrus fruits. The finish is long and supple, and ends with a slightly woody note and aromas of toast. Tasting review by Larsen Cognac: Nose : Aromas of coffee, cocoa, plums, and vanilla Palate : Delights with truffles, balsamic, spices, and brioche notes. Eye: Amber. Nose: Delicate floral and fruit aromas such as lychee, vanilla, passion fruit and lilac. Palate: A smooth, long finish. An enjoyable and elegant Cognac. The tasting set consists of three cognacs that you can also buy as 70cl bottles.